It’s important for your computer’s security to install the latest updates for any software you use. Updates fix errors and vulnerabilities and enhance operating system compatibility. 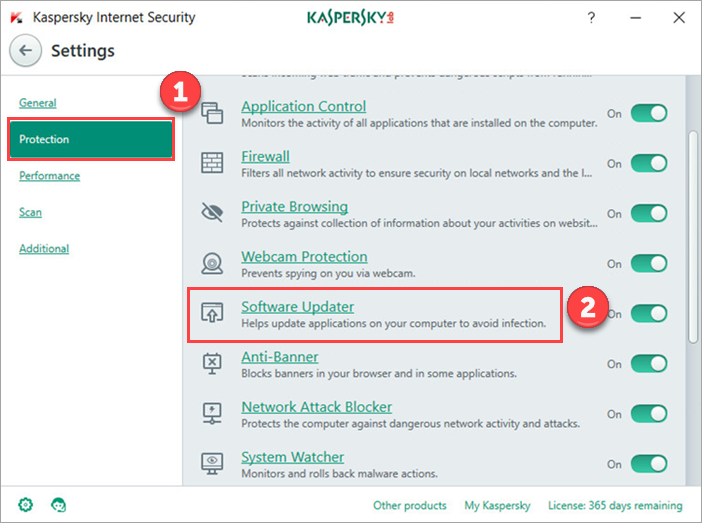 Kaspersky Internet Security 2018 automatically searches for updates for applications installed on your computer, and shows a notification in the right-hand corner of your screen should any be found. 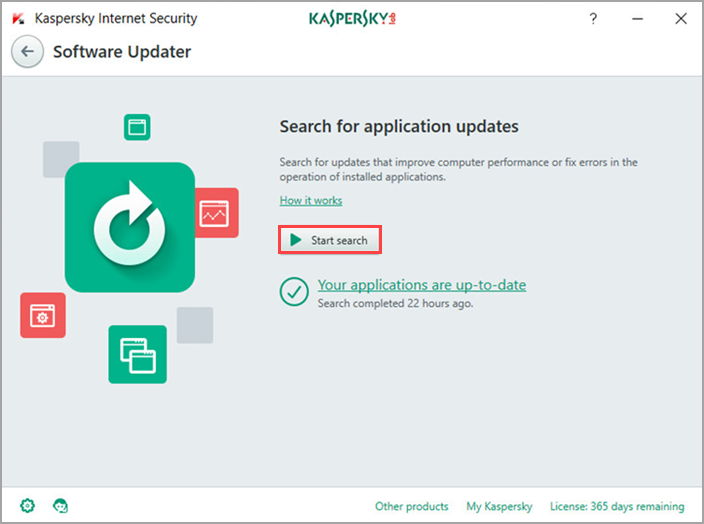 Scroll down to watch the video about how to install application updates with Kaspersky Internet Security 2018. 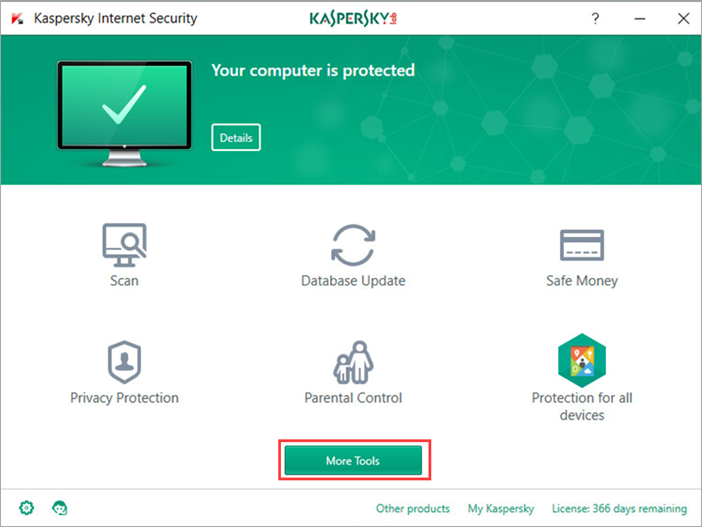 In the main window of Kaspersky Internet Security 2018, click More tools. If you have problems opening the application window, see this guide. 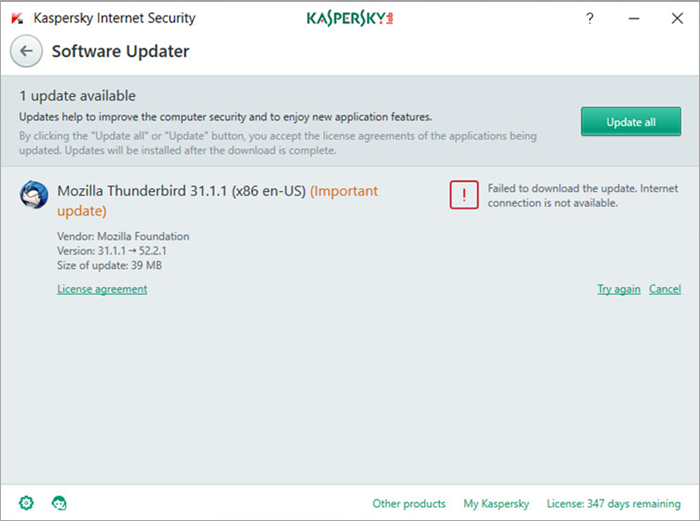 If new updates were detected for applications during the search, the link to the list of such applications will appear in the Software Updater window. Click Update all to install all detected updates. You can also install updates for specific applications. If you do not want to update the application, you can add it to the exclusions list. To do this, select Skip all updates from the drop-down menu. 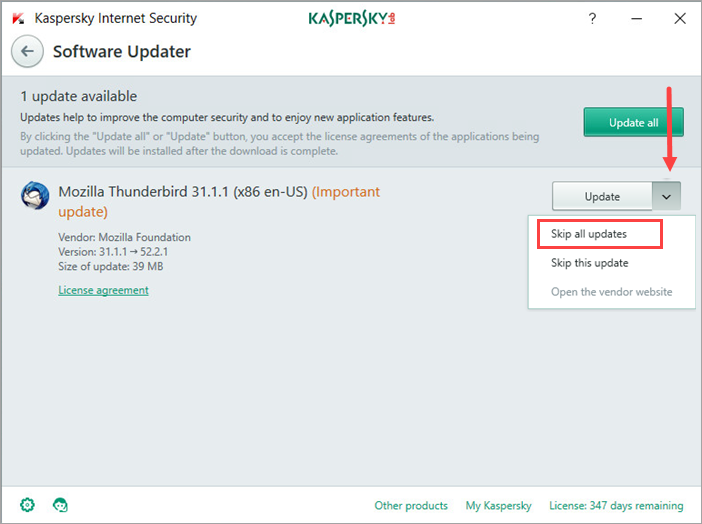 By default, Kaspersky Total Security 2018 downloads and installs all detected updates unless the update installation requires accepting a new license agreement. 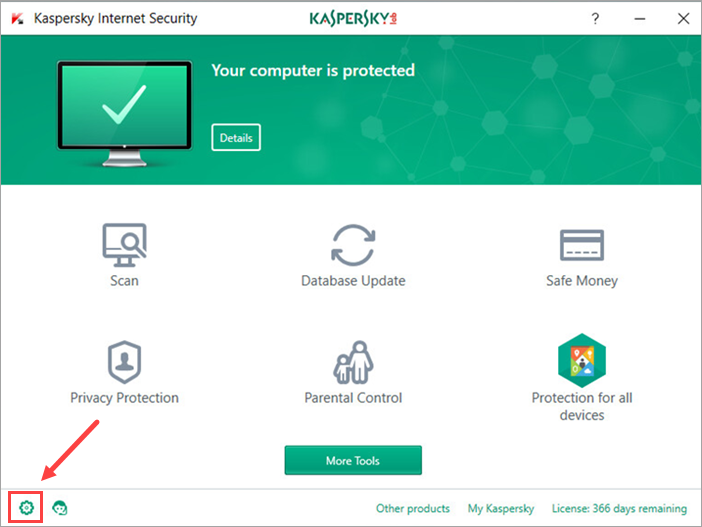 Open the settings of Kaspersky Internet Security 2018 by clicking the gear icon in the lower-left corner of the main window. 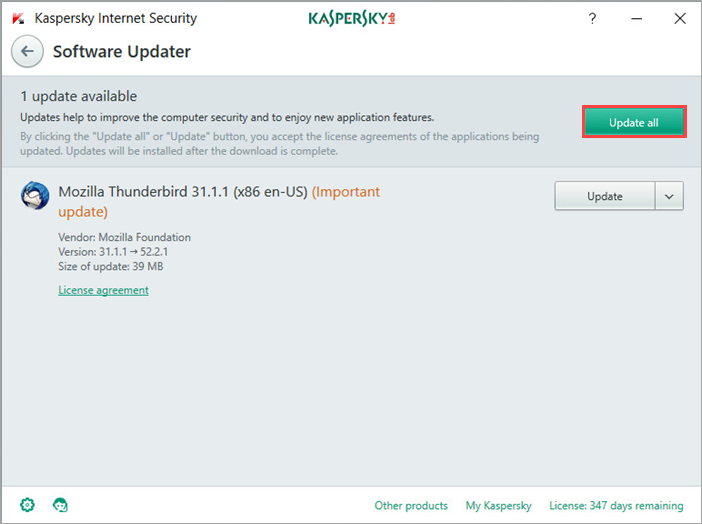 Got to the Protection section in the Settings window and select Software Updater. 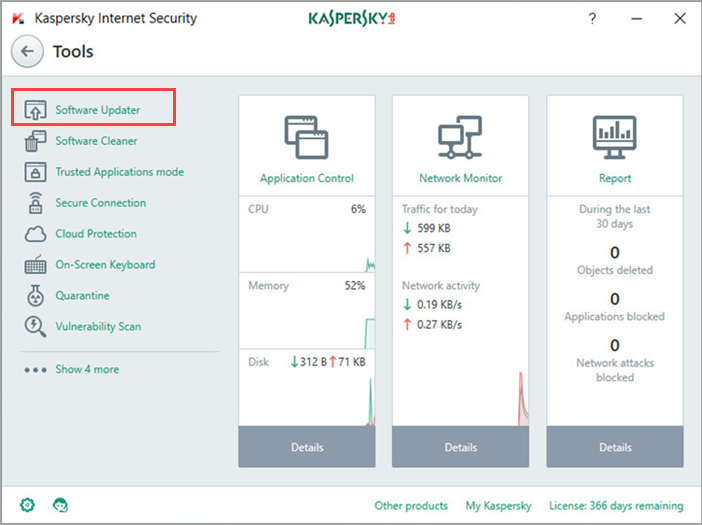 Under Search for application updates, select Important updates that improve computer security. To view the list of applications for which Kaspersky Internet Security 2018 does not search for updates, click Exclusions. 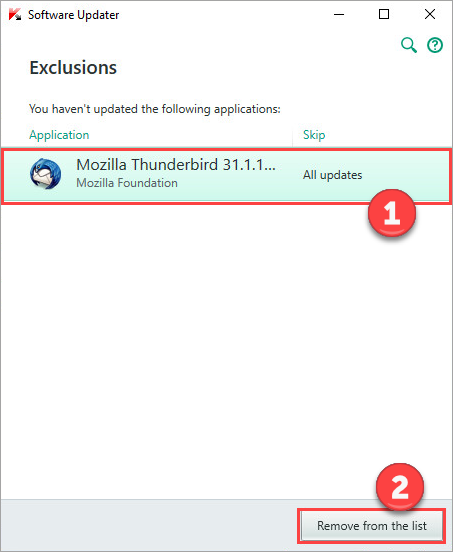 If you want to install updates for an application which is on the list of exclusions, remove it from the exclusions list. 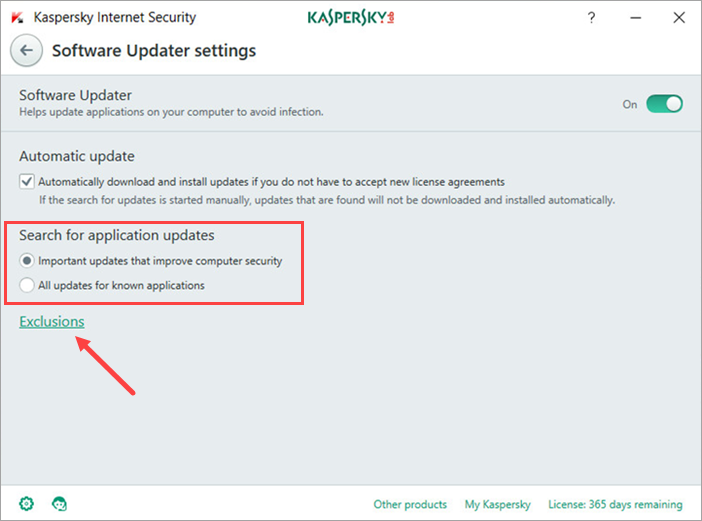 Kaspersky Internet Security 2018 will display a notification if it is unable to install an update for an application. For instance, if the update could not be downloaded because there was no internet connection available. Log into the system with administrator privileges. It’s possible that you didn’t have the permissions required to install the updates. Close all running programs before installing updates, as they might interfere with the installation process. Restart the computer once the updates have been installed. 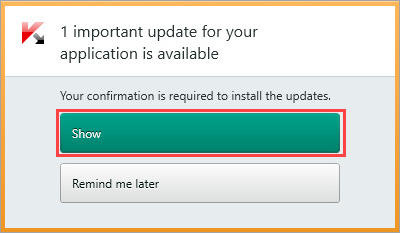 It is sometimes necessary to restart the computer to complete an application update.